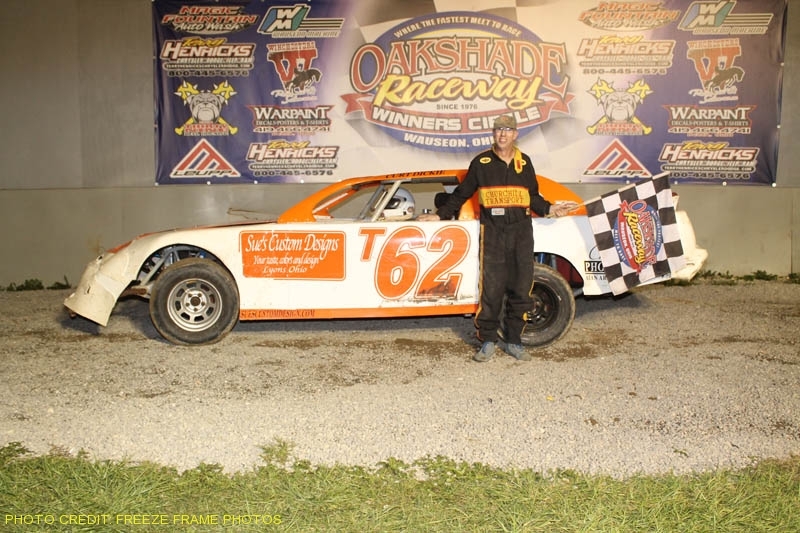 A downpour that occurred just before 6pm didn’t dampen the racing action at Oakshade Raceway on Saturday evening. It did, however, delay the start of the racing program a bit, but the great crowd of patient fans were rewarded with some spectacular racing action highlighted by Rusty Schlenk’s $2,000 Sunoco American Late Model Series (ALMS) win over Jon Henry and Matt Miller. After ending up on his lid in a wicked crash at another track the evening before, Schlenk started his night off with a photo finish heat race win over Ryan Missler. 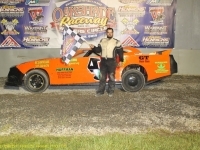 That earned the McClure, Ohio driver an inside row two starting position for the 30-lap ALMS feature event. 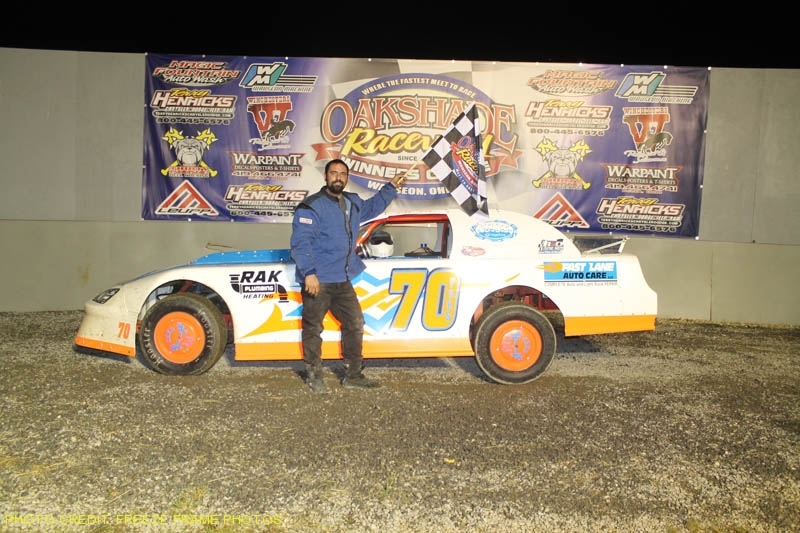 Steve Kester took off to the lead after starting on the pole of the feature, looking for his third consecutive UMP Late Model feature win at Oakshade Raceway. Matt Miller tracked him down and snatched the lead away on lap four. Schlenk got by Kester for second position on lap nine and it took nine more laps for Schlenk to find away around Miller. The only caution flag flew on lap 25 after Jeff Warnick’s spin, setting up a five-lap race to the finish. On the restart, Jon Henry became a contender after taking second from Miller, but he could not catch Schlenk. “The car was good everywhere…middle, bottom, top.” Schlenk said after the race. 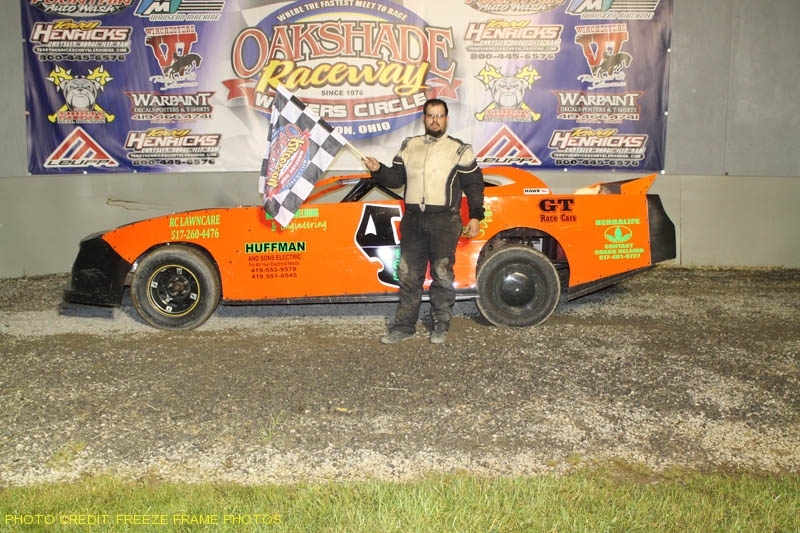 Kester held on for a fourth place finish behind Henry and Miller which keeps him atop the Oakshade Raceway late model point standings. Ryan Missler ended up fifth and sits second in points. Brad Eitniear from Wauseon, Ohio, led from flag to flag in the AmeriGas UMP Sportsman 20-lap feature event after starting on the pole. Outside pole sitter Mathew Chapman was unable to mount a charge on Eitniear and settled for a second place finish. Mike Jessen took over the points lead with his third place finish. Rusty Smith was fourth and opening night’s feature winner Tim Fisher ended up fifth. 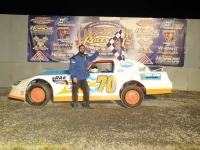 Defending Hot Rod Welding & Engineering Bomber track champion Jeff Foks picked up his second consecutive A Main feature win of the season after getting by Ryan Gorey and Chuck Stuckey. 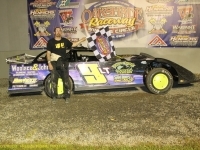 Rich Riffe worked his way up to finish second behind the Holland, Ohio, driver. Gorey slipped back to end up third after starting on the pole and Adam Noonan worked his way up to a fourth place finish after starting seventh. Stuckey wound up finishing in the fifth position. 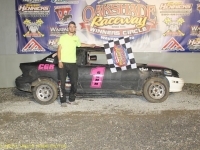 Cory Gumm sits atop the compact points after his feature win on Saturday night. Gumm, out of Hillsdale, Michigan, started inside the second row. Eric Carr started alongside Gumm and ended up finishing in the second position followed by Ken Watts, Joe Elliott and Rick Monahan. Wauseon, Ohio’s Justin Gamber didn’t waste much time getting to the lead in the final race of the night, the Hot Rod Welding & Engineering Bomber B Main. Gamber got by Cody Stetten and didn’t look back. A few laps later Scott Hammer got by Stetten for second but couldn’t catch Gamber who went on to pick up the victory. Donovan Paskan started deep in the field and managed a third place finish behind Hammer with Stetten and Dave McMannamy rounding out the rest of the top five finishers. 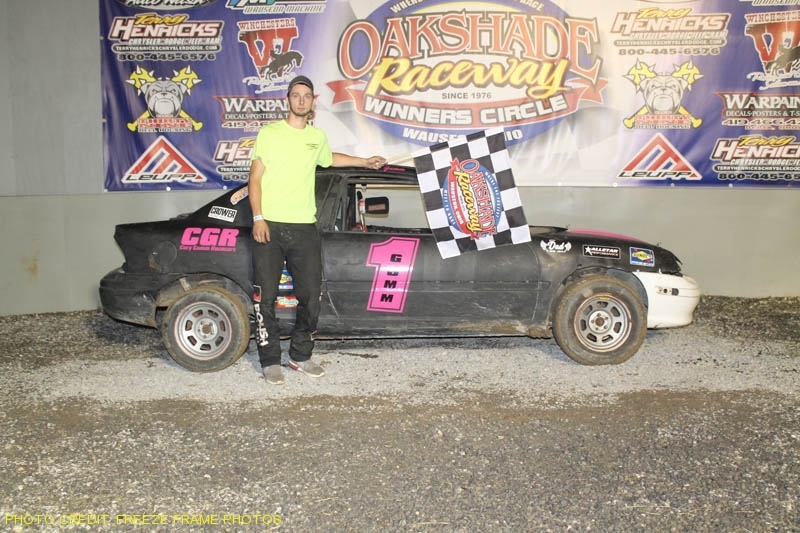 The racing action continues this Saturday, June 2nd at Oakshade Raceway with a full show of UMP Late Models, AmeriGas UMP Sportsmans, Hot Rod Welding & Engineering Bombers and Compacts. Gates open at 4pm, hot laps start and 6pm and racing begins at 7pm. 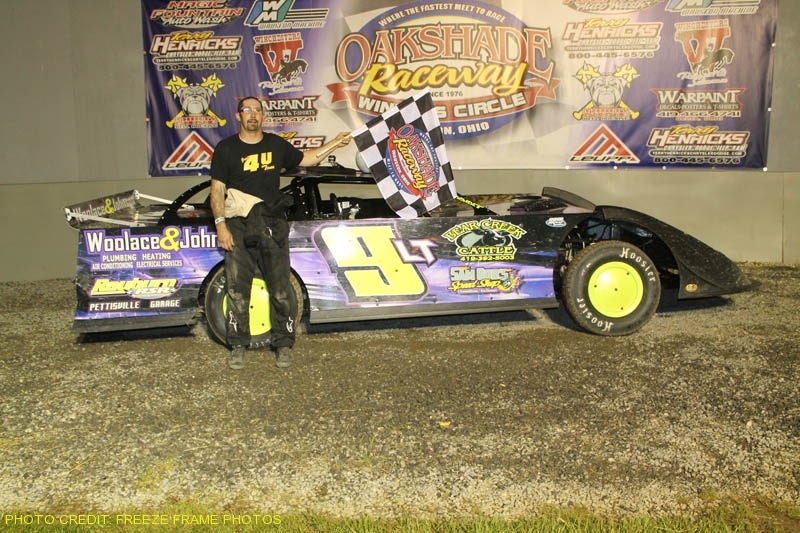 ← Sunoco American Late Model Series This Saturday!